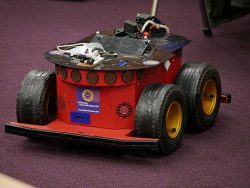 Budding engineers and Computer Science students at The Sixth Form College, Solihull got a taste of robotics and drones last week thanks to a visiting speaker from the University of Aberystwyth. Martin Nelmes, Teaching Fellow at the University of Aberystwyth came into College to talk to students about Physics and Computer Science, with the presentation focussed largely on robotics and drones. There was even working robots and drones in the session, which students got to try out! Students from the College’s Engineering Academy enrichment were invited to participate, as were students from the Physics and Computer Science A level courses. All these courses can lead to careers in robotics as engineering is needed for the manufacture of drones and robots, while computer science is needed to programme them how to operate. During the presentation, Martin Nelmes got the students thinking about how robotics work, the notion of Artificial Intelligence and the applications for robotics in the world today. As well as this talk from the University of Aberystwyth, students who are part of the Engineering Academy will get the chance to participate in local university masterclasses, visit local firms like Jaguar Land Rover and even travel to Geneva to visit the Hadron Collider at CERN.